Don’t be put off by pumpkin-orange upholstery on the car in the pictures – Rolls-Royce will trim the opulent cabin in whichever shade of leather and type of wood trim you’d like. The centre console that houses the air vents and storage compartments runs the length of the cabin and creates a 2+2 layout. With the cloth roof stowed, the wood-trimmed rear deck is visible. Opening or closing of the roof can be done at speeds of 50 km/h in 22 seconds, which is two seconds slower than what Mercedes-Benz claims its new S-Class Cabriolet can do. 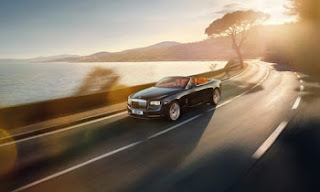 With near-silent running one of its main objectives, Rolls-Royce claims that, thanks to the aerodynamically optimised design, wind noise is very low when the roof is retracted. To compensate for a loss in structural integrity, the Dawn will have a firmer suspension setup compared with that of the Wraith thanks to new air springs and active anti-roll bars. The vehicle also has a shorter wheelbase, wider rear track and a lower centre of gravity. The 6,6-litre V12 shared with the Wraith and Phantom will be used in the Dawn; it produces 420 kW and 780 Nm of torque. Although these figures make for impressive reading, they will have to propel a portly 2,5 tonnes. A satellite-mapped eight-speed ZF-developed transmission will translate drive to the rear wheels, and Rolls-Royce claims that the Dawn will achieve a 0-100 km/h acceleration time of just 4,9 seconds. flat tyres. Other standout design elements include a stainless-steel waistline, door handles and exhaust tips. The Dawn also features a pair of reverse-hinged doors for easy access.